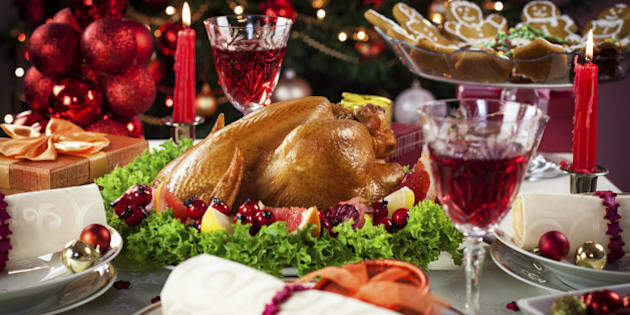 The holidays may be a time to relax and enjoy fine food, but when it comes to the big festive meal, savouring a plate loaded down with turkey, gravy and other favourites can put the human body in a state that is anything but merry. For a healthy person who rarely indulges in a big meal, the effects may ultimately be negligible. But there&apos;s no denying the stress that digesting a big meal can put on anyone&apos;s body, or how — depending on a person&apos;s year-round eating habits — all that sweet and fatty food can help spawn unhealthy conditions down the road. "I think we&apos;ve all been there," says Tanya Leung, a registered dietitian at St. Paul&apos;s Hospital in Vancouver. "We&apos;ve felt overstuffed or uncomfortable after a holiday meal." And there can be a lot of reasons for that: The meal involves large portions and foods that are high in fat and sugar, and it can be eaten later in the day or evening. Alcohol, which can also pack on the calories, may also be involved. Leung says it can take up to six hours to digest a large, high fat meal that also includes such fare as eggnog, sausage rolls, cheese and crackers and gravy on the meat or potatoes. That&apos;s in comparison to the two or three hours it could take to digest a meal featuring food lower in fat but higher in vegetables, lean protein and a reasonable portion of starchy foods. The actual digestion process is itself something of a marathon, and when there&apos;s more food involved, there&apos;s more stress on the system. Dr. David Jenkins, a professor in the University of Toronto&apos;s department of nutritional sciences, can quickly rattle off how that all happens: After the meal, the stomach is very full, pumping and pushing the food out at the rate of about one per cent a minute. The intestine, he says, is quite efficient at doing its job, as carbohydrates, proteins and fats are absorbed. "As a result, the carbohydrate foods will give you a big rush in terms of glucose levels, and together with the protein and the aminoacids, you&apos;ll secrete a lot of insulin." If your pancreas is working well, that shouldn&apos;t be a problem. If not, the pancreas has to work even harder to push out insulin to keep the blood glucose under control. Fat gets absorbed in the lower part of the small intestine. If there&apos;s a lot of fat, that can ultimately get sent into the blood. Remnant fat particles loaded with cholesterol will get to the liver. "The cholesterol won&apos;t rise quickly after a meal but it will rise slowly over time so you set some things in motion," Jenkins says. "So basically it could be said you&apos;re not doing yourself a big service." Blood pressure will also increase. Eating a large meal may also trigger certain people to feel bloated, have reflux or feel gassy, says Leung, who is also a clinical instructor at the University of British Columbia. In the long run, consistent overeating can lead to obesity, and increase the risk for chronic illnesses such as heart disease and diabetes, she says. Of course, the human body is built to handle a lot, and if a person is healthy, one big meal doesn&apos;t spell instant or ultimate doom. "If you&apos;re a person who really has only one meal like this a year, the rest of the time you eat sensibly, you eat your fruits and vegetables, you take plenty of exercise, you have rest and recreation and you&apos;re generally slim and skinny and happy, taking one big meal like this won&apos;t do any harm at all," Jenkins says. "The trouble is there aren&apos;t too many of us left in the world like that." While people may think the festive fare they consume could contribute to large weight gains, research suggests otherwise. But the weight they do put on may ultimately stick around. Leung says studies have shown people only gain one to 1.5 pounds over the holidays, not the 10 to 15 pounds they think they put on. "The good news is you&apos;re not gaining as much as you thought you did," she says, "but what they also showed is that they think that this 1½ pounds is what most people gain per year on average, that most of the weight they gain per year is due to holiday weight gain." Taking the weight off isn&apos;t always easy, either. There may be a lot of calories in play — Leung&apos;s heard of estimates up to 7,000 for the typical Christmas dinner, or enough calories to add two pounds of weight. (Health Canada&apos;s highest daily caloric level — for 17-to-18-year-old males — is 3,300). Jenkins estimates a meal of 1,500 calories would add about 200 grams, or 0.44 pounds, of weight. And it&apos;s not necessarily easy to make those calories disappear. Leung estimates it would take an hour and a half of walking to burn off the 100 calories in just one cup of eggnog. So, what to do? You want to enjoy food at this time of year, but give your body a break, too. Jenkins is a big proponent of not making the big meal such a focus of the festivities. "I think one of the best strategies is to enjoy a small amount of food but think of other activities that can be enjoyable." If there is some choice in your holiday food, opt for more plant-based types of food, he suggests. "Eat things that are more bulky, have more water in them." Don&apos;t have two servings of turkey, and maybe consider having some tropical fruit for dessert. "Do something unusual," Jenkins says. "Maybe you forgo some sausages…. Have something else, some extra vegetables." Leung says it is important to consider portion sizes and respect the natural cues your body can give you letting you know you&apos;re full. To do that, eat more slowly, and chew food really well before swallowing. Try eating with your non-dominant hand — you&apos;ll naturally be going more slowly. Even try wearing some snug clothes you know make you look good — they&apos;ll let you know when you&apos;re full. Also consider the size of the plate or the cup you&apos;re using. "If you&apos;re trying to control your portions and if you&apos;re putting it on a huge plate, it looks like a very small portion, whereas if you put it on a smaller plate it looks much more reasonable to you and you can actually feel just as satisfied that way," Leung says. If all else fails and you do end up having a meal high in saturated fat, Leung says there is research that suggests eating a small handful of walnuts can help reduce the onset of inflammation or oxidation of the arteries, even in people with higher cholesterol. She does, however, caution that portion control is "still very important" because while nuts have health benefits, they also come with high calories. In the end, the best strategy is to try not to overeat in the first place, Leung says. Remember moderation, and listen to the cues your body gives you, she says. "I think the bottom line is it&apos;s OK to enjoy traditional holiday foods that are served, but it&apos;s just good to be mindful of the portions, especially saturated fats or sugars."